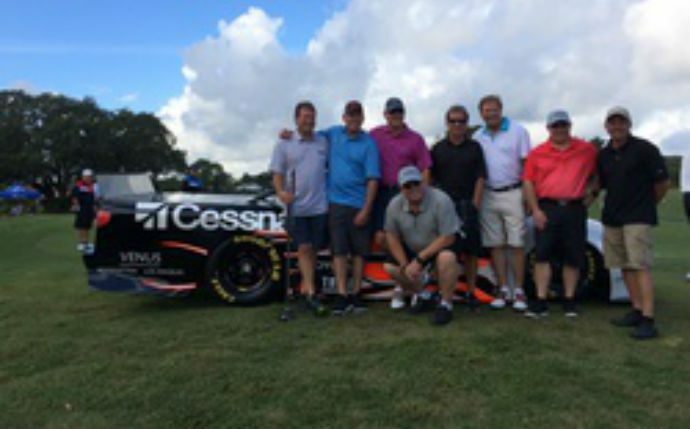 DAYTONA BEACH, Fla. (October 23, 2015) – More than 20 celebrities are expected to travel to Volusia County October 28-29 for the 2015 Cessna Skinner Round-Up benefitting the Council on Aging of Volusia County. The two-day event will feature a Hoedown Bash at Daytona International Speedway, where attendees will be able to mix and mingle with the celebrities, as well as a Golf Tournament at Spruce Creek Country Club where the celebrities will go head-to-head for bragging rights. Tickets for both events are still available. Attending the event will be a mix of former athletes, musicians and entertainment personalities. Skinner will reunite with some of his toughest competition from the NASCAR Camping World Truck Series, as Todd Bodine, Rick Crawford, Ron Hornaday, Steve Park and Jack Sprague all attend this year’s event. Together, the rivals turned friends account for 10 series championships and over 130 wins. Also attending the event will be former NASCAR driver Greg Sacks, a Port Orange, Fla. resident and NASCAR Sprint Cup Series race winner at Daytona International Speedway. Former NFL standouts Ken Huff and Chris Mohr, who have four Super Bowl appearances between their careers, will also be in attendance. Jack Marin, a retired NBA player who also earned All-ACC honors for Duke University during his college career, will round out the list of professional athletes attending the Cessna Skinner Round-Up. Nashville Blues’ Doctor Stacy Mitchhart will perform the Hard Rock Seminole concert on the Management Resource Systems Stage at the Hoedown Bash. Additionally, Nashville recording artist Tim Dugger and talented singer-songwriter D. Vincent Williams, will also be on-hand throughout the event. SiriusXM NASCAR Radio personalities Mike Bagley, Pete Pistone and Pat Patterson will all attend the two-day event, while Bagley and Pistone host a live broadcast of their daily radio show, The Morning Drive, from the Skinner Round-Up Golf Tournament presented by Halifax Health. Television hosts Kelly Edge (HGTV), Karen Lee (co-host of Turkey Call, a National Wild Turkey Federation television program), and local media personalities Leslye Gale (Central Florida News 13 and Magic 107.7 FM) and Frank Scott (The Rock of Daytona 104.7 FM) will also be attending the two-day event in Daytona Beach, Fla.
Attendees of the Cessna Skinner Round-Up will have the opportunity to meet the celebrity guests throughout the course of the event. The celebrity guests will be introduced to the crowd on the Management Resource Systems Stage at the Hoedown Bash on Wednesday, October 28, before playing golf against each other at the Skinner Round-Up Golf Tournament presented by Halifax Health on Thursday, October 29. In 2015, the Cessna Skinner Round-Up will benefit the Council on Aging of Volusia County. In partnership with the community, the Council on Aging promotes healthy, independent living through caring and compassionate services. The Council on Aging of Volusia County serves thousands of clients every year through meals programs, non-medical health services and senior activities. Tickets for the Cessna Skinner Round-Up Hoedown Bash can be pre-purchased online at MikeSkinner.com/RoundUp, or on the day of the event at Daytona International Speedway’s Williamson Blvd. entrance. The event begins at 7 p.m. ET on Wednesday, October 28, and tickets are just $10 for adults while children ages 12 and under are admitted free. For additional information on the two-day Cessna Skinner Round-Up charity event, please visit MikeSkinner.com/RoundUp, or follow us on Facebook (facebook.com/skinnerroundup), Twitter (SkinnerRoundUp), or Instagram (SkinnerRoundUp). The Cessna Skinner Round-Up is back in Daytona Beach! Returning to Volusia County after a three-year hiatus, Mike and Angie Skinner started the two-day charity event in 2005 as a way to give back to their local community. Benefitting the Council on Aging of Volusia County with two days of events, this year’s Cessna Skinner Round-Up will take place October 28-29, 2015. It will be a party in the infield on Wednesday, October 28 with the Hoedown Bash at Daytona International Speedway! The event will feature the Hard Rock Seminole Concert by Nashville Blues Doctor Stacy Mitchhart, games for all ages, the largest silent auction in Volusia County, and an all-you-can-eat Taste of Daytona event. Tickets for the Hoedown Bash are just $10 for adults, with children ages 12 and under admitted free. The party moves to Spruce Creek Country Club on Thursday, October 29 for the Skinner Round-Up Golf Tournament presented by Halifax Health. Players will take on the 18-hole par 72 course, which was named one of the ‘Top 5 Best Golf Courses in the Daytona Beach area’ by Golf Digest. Individual players are still able to register for the event, with the individual player fee costing just $150. For additional information, please visit MikeSkinner.com/RoundUp.